When it comes to marketing your financial advisor business, one of the most important decisions you will make is selecting the right marketing partner(s). – the best financial marketing team. It is a complex process riddled with suppliers who innocently over promise and under deliver. In fact, most of our clients come to us because they’ve been under-served elsewhere and there is a heightened level of caution before proceeding. Selecting your financial marketing partners is a decision with a magnitude that should be right up there with buying a house. In our world of silver bullets and quick fixes it’s easy to get caught in headlights of empty promises. There are plenty of self proclaimed “experts” in almost all areas of marketing, and they are all clamoring for a piece of your advisor marketing budget. The good news is that there are pragmatic steps you can take to move along and make the right decisions. What follows are some selection tips to help you figure out what questions to ask to help you make your decision. In order of importance, here are 9 selection tips to consider when researching and selecting a marketing partner to help grow your financial firm. The best partners to work with are built with people who enjoy their work, and working together. Equally important is a culture of not just about doing the right things, but doing the right things and achieving results. There are a lot of firms who have the ability to create great designs, but it’s more important to find partners who focus on results first. The best cultures are the ones where the people aren’t afraid of constructive debating and hard work to get the best results. After finding a marketing partner that fits with your culture, raw talent trumps almost everything else. Talent comes in a lot of forms. Consider creative, tactical, technical, and analytical talents in your search. 3. Hire for industry experience. Plain and simple, hiring a firm who understands the financial industry will save you time and headaches. Also make sure their marketing isn’t too conservative and that they haven’t been jaded by the inherent compliance-based limitations. Adhering to compliance restrictions is a must. Equally important is knowing how to collaboratively push the envelope. Marketing firms with diverse talent have a more coordinated approach with more big-picture understanding and cooperation. Breadth yields a more complete solution and a focus on what the client needs versus having to recommend a narrower set of services. A coordinated approach is a pre-requisite for marketing success so make sure your marketing partners understand how differing tactics can work together for the best outcome. 6. Expand your talent pool. If you only search for local firms, you’re potentially missing out on a much larger talent pool. Given today’s desktop sharing and video conferencing capabilities, the old saying about location-location-location just doesn’t matter anymore in most business to business relationships. As long as there are no language barriers, and as long as your marketing partners understand your local environment, your style, and your client base, you should be able to expand your search nationally or internationally to source the best people to get the job done. 7. Don’t choose by price alone. Shortcuts in marketing most often need complete re-dos when they fail. It’s not like you can salvage a poorly designed website or a lackluster email campaign. There’s wisdom in the saying, “do it right the first time.” Ensure pricing is only one criteria in your decision matrix. We’ve all experienced situations where a seemingly low price wound up costing us more in the end because of the product quality. 8. Know who in your financial firm are the ultimate decision makers. It’s important to know who is/are making the decisions. Everyone else should be contributing his or her insights to help them reach the best decision. 9. Hire for the future. Don’t hire a marketing partner based on what it did 5 years ago. Hire based on the company’s understanding of marketing today and its philosophies and vision into the future. 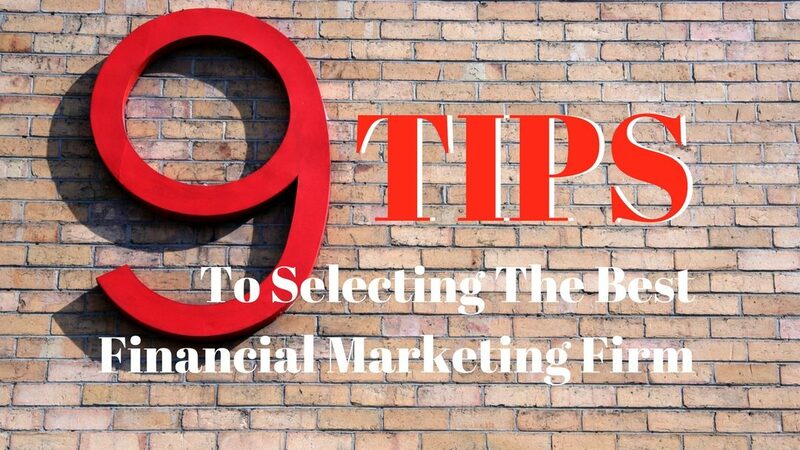 These 9 tips will help you secure the best financial marketing available to you. All the best in your search.